Finalists for the Dulux Colour Awards have been announced following a record-breaking 435 entries from Australian and New Zealand design professionals. 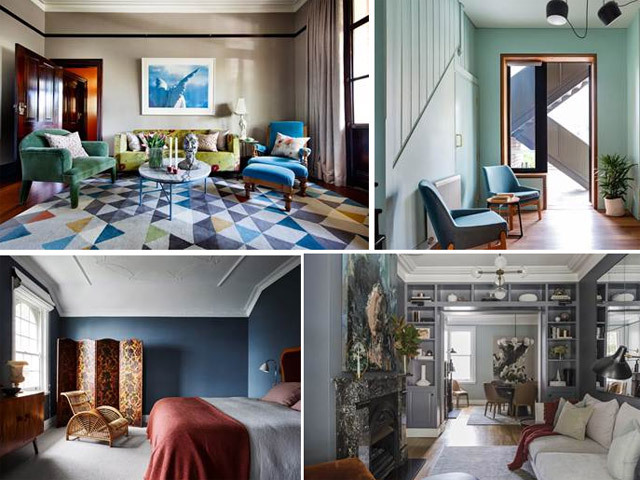 A panel of colour experts selected 114 finalists who displayed exceptional and inventive use of colour in built environments across both commercial and residential spaces. Finalists for the iconic program, now in its 33rd year were chosen across six categories: Commercial Interior: Public and Hospitality (23 finalists); Commercial Interior: Workplace and Retail (24 finalists); Commercial and Multi-Residential Exterior (16 finalists); Residential Interior (29 finalists); Single Residential Exterior (11 finalists); and Student (11 finalists). "We were thrilled to see the calibre of submissions for this year's awards program," says Andrea Lucena-Orr, Dulux Colour Planning and Communications Manager. "Architects and designers have really set a new precedent with their masterful and innovative employment of colour to create unexpected, lively, playful and refined interior and exterior spaces. "We have seen moody reds and maroon emerge as dominant colours in retail and commercial interiors, paired with unexpected tones such as peach and clay in the form of accent walls, stairwells, doors and trims. "Deep shades of blue were a popular choice in residential interiors – from azure through to dark navy – seen in cabinetry, trims through to feature walls. Meanwhile, greens ranging from soft sage to emerald have lost none of their appeal adding sophistication, character and a sense of quiet luxury. "There has been a shift away from greys and cooler neutrals which have dominated interiors in previous years, with naturebased warm hues, such as beiges, terracotta and caramels coming to the fore. "Classic all black and all white remains popular, particularly in residential exteriors – they are shades being used to contrast against red brick or being layered to create a modern textured and tonal look. "We were also impressed with this year's student entries, which delivered brave and unique colour concepts and applications." The 33rd Dulux Colour Awards finalists will now be judged by a panel of leading figures in the design industry including; Rosa Coy, Director of Coy Yiontis Architects; Mardi Doherty, Director of Doherty Design Studio; Simon Farrell-Green, Editor of HOME New Zealand magazine; Matt Gibson, Director of Matt Gibson Architecture + Design; and Carole Whiting, Director of Carole Whiting Interiors + Design. The judging panel will select winners across the six categories, with all category winners (excluding the Student category and New Zealand entrants), having the chance of taking home the Australian Grand Prix title and AUD $5,000. New Zealand entrants will have the chance of taking home the New Zealand Grand Prix title and NZD $5,000. Winners of the 33rd Dulux Colour Awards will be announced at a gala event at the National Gallery of Victoria on 8 May 2019. For more information on the 33rd Dulux Colour Awards, visit dulux.com.au/colourawards.